Introduction; Earth science resources and the internet; Databases and other resources for the Polar Regions; Geochemistry; Geophysics and environmental studies; Marine sciences; Palaeontology; Geology and geomorphology; Conclusions. Though an enormous amount of information relating to earth sciences are available on the Internet, for a serious researcher, teacher, librarian or a student who has deadlines to meet, searching the Internet for specific scientific information can at times be frustrating. 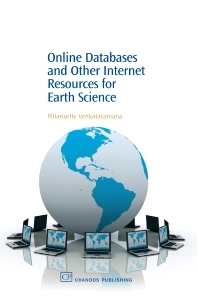 The main purpose of Online Databases and Other Internet Resources for Earth Science is to group these resources together and to provide the URLs and hyperlinks so a researcher, teacher or student can access them with the minimum effort, time and cost. The book also introduces the reader to a few basic concepts that propel the Internet and the world wide web so that he or she can make informed searches apart from assessing the quality and reliability of the data available on the internet. A brief introduction is provided on the current status of the draft treaty by the World Intellectual Property Organization (WIPO) and the EU directive on copyright restrictions for scientific databases and what a researcher is permitted to do with the data obtained from the Internet, especially those from a commercial data provider. The databases are further grouped into bibliographic data, specimen collection, chemical analysis, geophysical data, etc. Dr Pillarisetty Venkataramana holds a PhD in geochemistry and petrology from the Indian Institute of Science, Bangalore, India. He worked as a professional geologist for 22 years in the Geological Survey of India and has wide experience in geological mapping, mineral exploration, GIS, computer programming languages and RDBMS. At present he works for Domex e-Data Pvt. Ltd., a knowledge management and outsourcing company based in Chennai, India as its Executive Director.